JPG to PDF Converter is a utility software for Windows that can easily and quickly convert to a PDF document from a set of images. JPG to PDF Converter comes with easy to use interface and supports most of the common image file formats including JPG, GIF, BMP, TIF, PNG, TGA, PBM, and PSD (Photoshop document format). With JPG to PDF Converter, users can edit PDF title, create date, PDF subject, and PDF keywords. Besides that, the program also can convert 92% faster than other PDF converters and ability to compress PDF file size up to 85%. JPG to PDF Converter normally cost $29.95 for purchase. The developer of JPG to PDF Converter is now offering free JPG to PDF Converter in a giveaway promotion that lasts for 30 days, which ends on March 22, 2011. Install and using the license key code “4867JWVI3C3F5D9” to unlock the program.Note: the license key code is same for everyone. 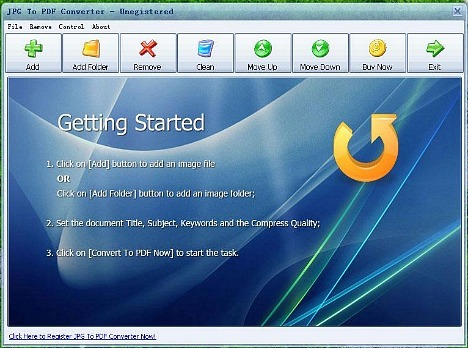 JPG to PDF Converter supports Windows 2000, XP, Vista, and Windows 7.